I'm covered up in work and was not able to prepare a proper post today. I did, however, have to make time to declare my love for this living room designed by Miles Redd. I'll only show a snippet of the room in case you haven't received your July House Beautiful yet. Look at those gorgeous shades of blue! 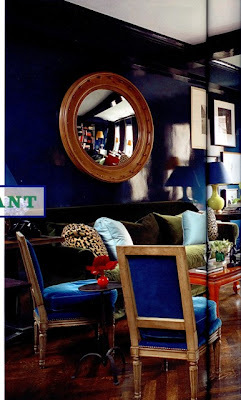 The lacquered deep ink stained walls, the brilliant blue velvet on the chairs, and the icy toned pillows. Not to mention the moss green sofa (another favorite color of mine) plus leopard pillows. Stunning. Dazzling. Absolutely perfect. Of course, I have been pouring over mine! I have to say it is one I have been picking up a lot this past weekend! Jennifer-I have been dying to try the F & B Hague Blue-it is wonderful. But what I can't stop looking at is the de Gournay paper and green leather with nailhead doors. OMG, I'm weak at the knees! I agree this really is an honest classic room-in entirety . One remarkable thing- it's completely grounded in real furniture not a kitschy thing in talk, or a token mod chair or trendy bench parading through to say- "I can mix mix mix,"
The entire issue is terrific, but you're right, this home is knock your socks off. The "bone" trim in the bedroom is legendary. I loveee the color of the walls! The gold mirror looks amazing up against the navy! And that small green kitchen -- amazing! i really love the blue walls. that said, i fell in LOVE with the green kitchen! LOVE. the green casement windows. the sub-zero painted green!!! completely inspired! I haven't stopped thinking about it for days now. one of my all time favourite spaces. Drop dead spectacular. I cant stop staring at my issue!!!! Now where is my copy of HB? What a poetic description of the wall color!! My husband, a fountain pen collector, would be ga ga over this color - lacquered deep ink stained walls! And for those of us who have been on the fence about House Beautiful subscriptions? We have jumped on board. And, Peak of Chic, how absolutely grand that you have posted the name of Thomas Loof, the photographer.Giving photographer atrribution is long overdue in blogland (I new to this country). Without the photographer's eye and skill, this particular room would have been mush. However, every glittering surface is magic, visible magic. What's new? Wipe off the drool with my linen napkin. I mean seriously another RUN to my mail box today and no issue yet and I have checked the grocery store news stand as well. Hmmmm. Maison21 and I are suffering in California and will just get this issue when you will be onto August already. I used to love the surprise of getting the new issues- but it is so hard with all of these pre-views and it makes me want see even more! This entire project is simply drool-inspiring (those green leather doors are INSANE), as is the Jonathan Berger-designed cover home... I keep saying it to anyone who will listen (and apologies in advance to those in California), but this is the best issue of any home magazine I have received in months! Bravo, House Beautiful. After his pink and red room, and then the magnificent green dining room this spring, another really strong colorist choice. I've been thinking about what makes Redd stand out for me lately; it is his fearless use of strong color in an era of beige and creams, while still creating comfortable, slightly cluttered British style rooms. There are other people with strong use of color, Gambrel or Saladino for one, but Redd seems to be going farther right now. It seems to me also, that he's evolved into this, don't you think? Other rooms on his sight are much more pale. Fully appreciated and chuckled regarding the comment from little augury about "I can mix"...so funny. The green kitchen and "dining" area are contenders for my favorite rooms of the year. Stunning. He is an absolute genius! Agreed! I'd been flipping through House Beautiful a little quickly lately, but this home stopped me in my tracks. Simply stunning. Wah.. what a nice room. Blue velvet on the chairs is very attractive. I like this room.